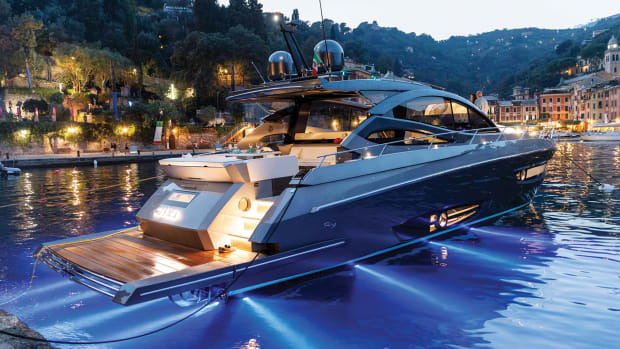 Designer Alberto Mancini has put his signature style on the new Fairline 63 GTO. 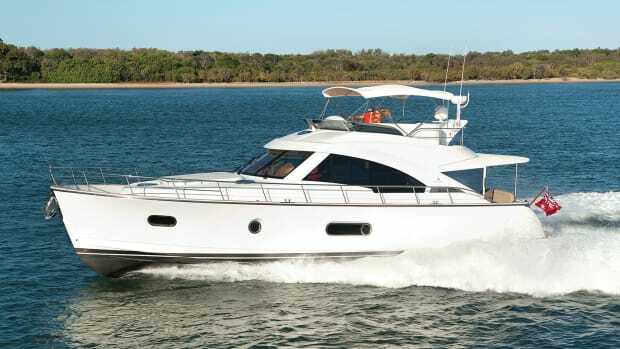 Crowds gathered around the stern of the Fairline Targa 63 GTO. 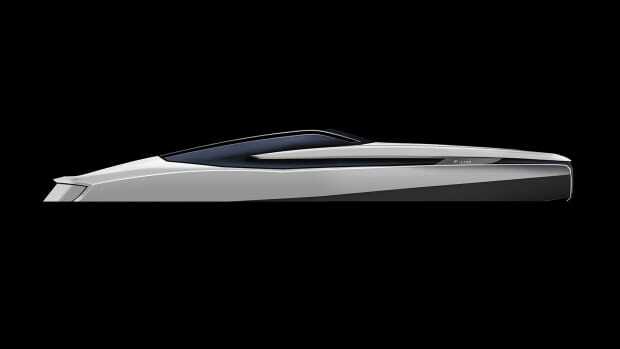 Designer Alberto Mancini was handed a black magic marker, and, laughing, he was pressed to sign his name on the transom. It was a symbolic moment and as he flicked his wrist and left a neat, elegant signature on the white fiberglass the crowd cheered. 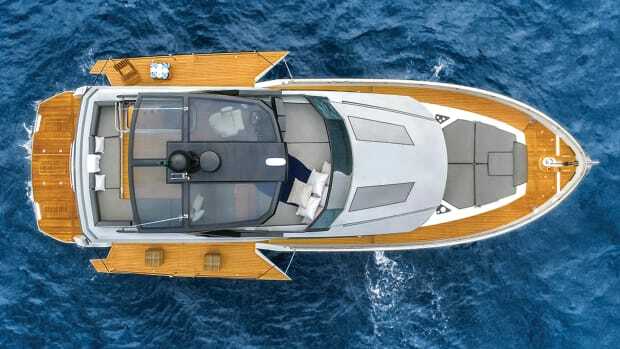 Mancini was a pivotal player in shaping the 63 that debuted in Cannes last September and in the U.S. at the Annapolis show in October. 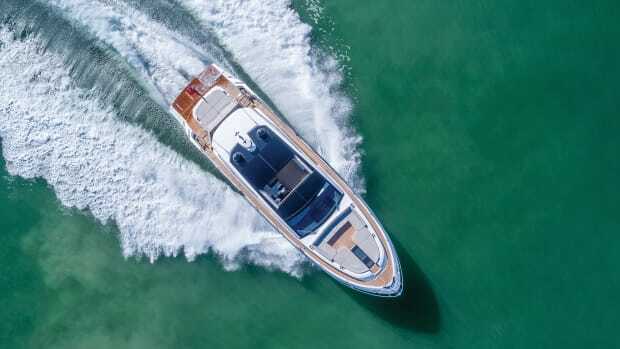 Speaking of shaping, the 63 GTO—the O in GTO stands for open—performs double duty as an enclosed motoryacht and an open express boat. 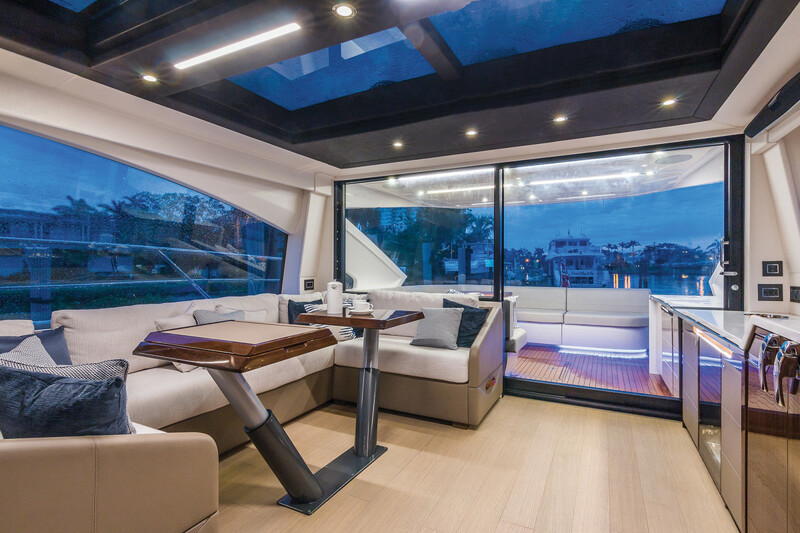 The door to the salon simply slides to starboard then drops, along with the salon window, down into the deck. This is a trick I’ve seen before but with the size of the door and window on the 63, it really is impressive. A feeling of openness continues into the salon where deck-level windows and an expansive sunroof fill the space with light, even on a cloudy day. A smart touch that you won’t notice is that the windows are covered with a film that reduces harmful UV rays by as much as 50 percent. That’s forward thinking you really can’t put a price on. The galley on our test boat was up, located to port of the helm. 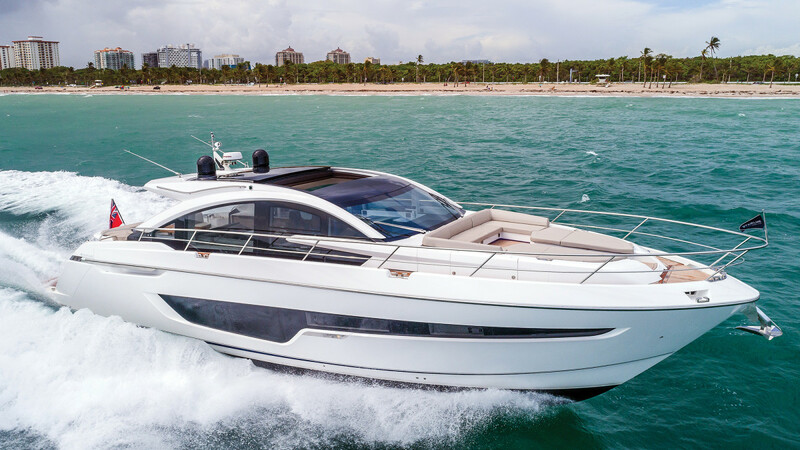 I liked the position there but because Fairline has become such a global builder it offers no fewer than six galley locations. The 3-stateroom layout of our test boat (a 4-stateroom version is available) is conventional in placement but little else. Near-water-level windows in the staterooms not only bring in light and ventilation but an oddly mesmerizing view of the water flying by underway. As a marine journalist I try to not seem overly impressed by any one feature when walking through a boat for the first time. Then I learned that the mosaic details in the head were actually from thinly sliced sea shells. Yes. Really. 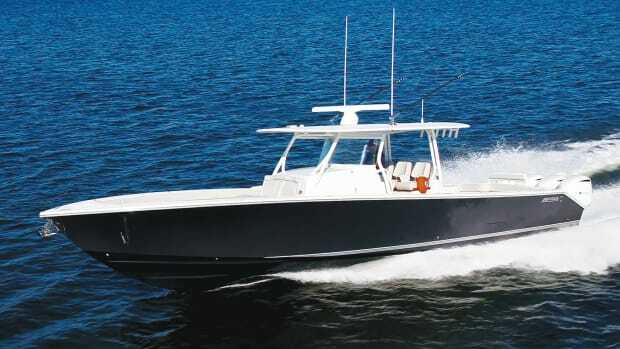 Finally it was my time to take the 63 away from the dock and into open water. 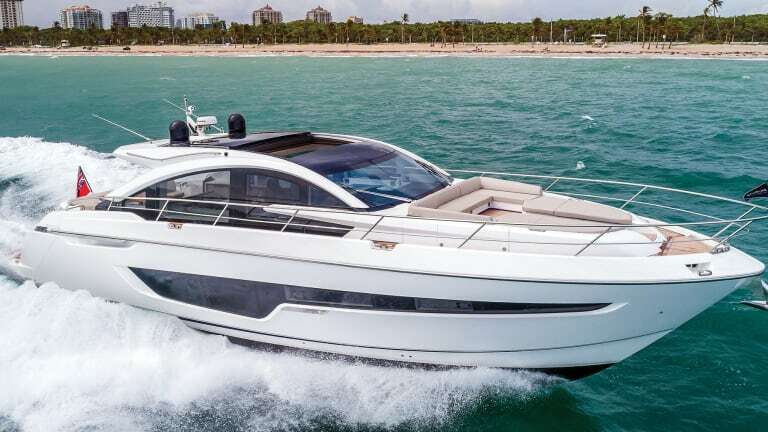 The 1,150 horsepower Caterpillar C18s quickly brought the boat to about 28 knots. The builder is hoping to gain a few extra knots from a different set of props. 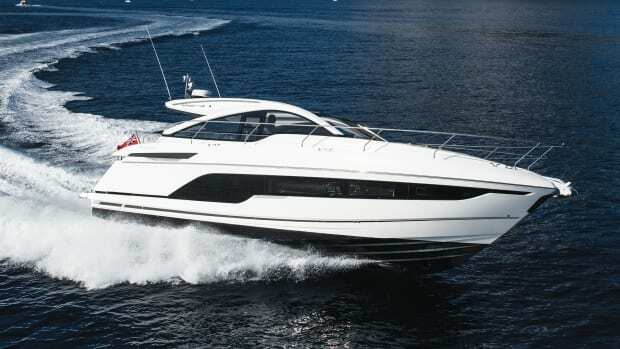 Despite some of the sleekest, sportiest lines I’ve seen on a Fairline the boat has very little heel in turns. And even though I thought the turns would be sharper, they were comfortable. Comfort. That’s the high point of this boat’s ride. 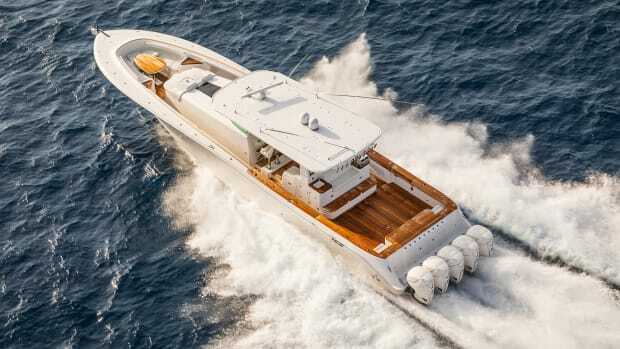 With naval architecture from Vripack, the 63 was stable and surefooted when running through its own wake. 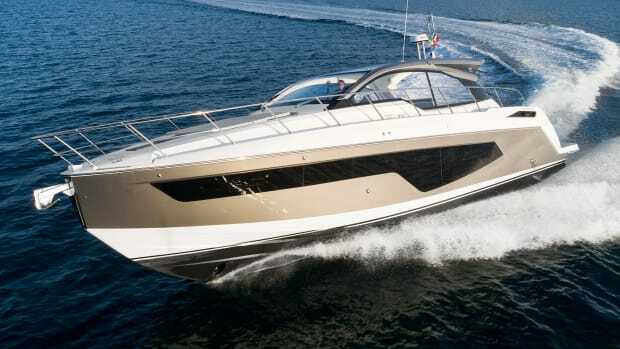 Part of that comfort equation is the hull design of course, but it’s also courtesy of how much attention Fairline paid to sound attenuation. Flexible couplings on the shafts and flexible engine mounts added up to one of the quietest rides I’ve encountered. I registered 71 decibels of sound at the helm at WOT; for comparison’s sake, 65 decibels is the standard noise level of a normal conversation. Reflecting on my test, I thought back to Mancini signing the boat’s transom. He may have signed it with an erasable marker, but it’s clear that he left his mark on the Targa 63 GTO and will be helping Fairline pen their future.